After Wes Anderson's charming 2012 film, Moonrise Kingdom, he continues his preoccupation with childhood nostalgia and dollhouse mise-en-scene with Grand Budapest Hotel. It is the century-spanning tale of an eloquently foul-mouthed concierge, Gustav H. (Ralph Fiennes) and his loyal lobby boy, Zero Moustafa (Tony Revolori). 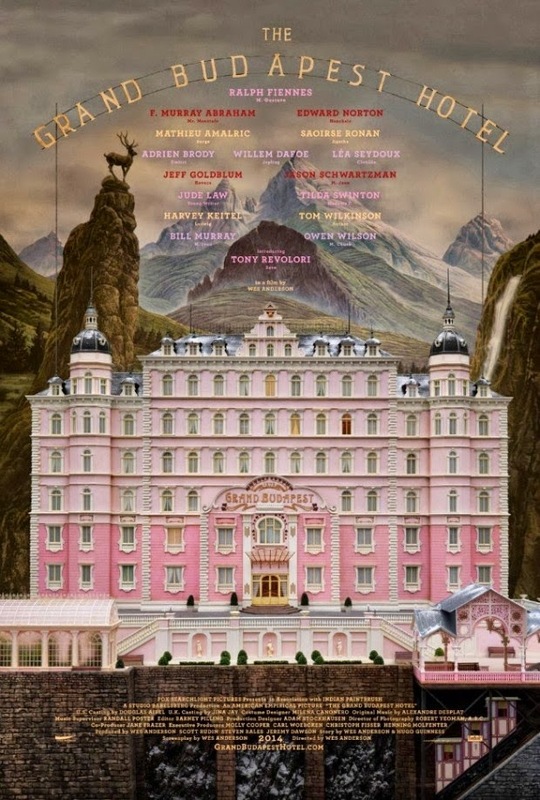 From first sight of the luxurious Grand Budapest, ('an enchanting old ruin', we are told,) Anderson has underlined the artificiality of his set; he reveals cut-out, coloured-in backgrounds as if in a Ladurée-themed storybook. Jude Law's voice-over even peppers its narrative with 'he said' and 'she said' around the actors' lines. The film is laid out in a triptych structure, set in three different eras with the through line of various characters at the hotel. In the 1930's, 60's, and 80's, we learn of M. Gustav and Zero's run-in with a malevolent family. When a final will & testament leaves a priceless painting to Gustav, the film unfolds into a lavish, comic chase story. The triple structure is instrument both temporally and spatially; Anderson not only volleys between three eras, but follows the same story-within-a-story visual framework. The action is forever framed by prosceniums, arches, doorways, and other structures which make the audience self-aware of its positioning - as, of course, an audience. The star-studded cast and setting of the film cannot help but to bring to mind the 1932 MGM classic, Grand Hotel -- a section begins in the very same year. Adrian Brody is a dashing black-clad villain, like some ominous uncle from a Gothic novel; Jeff Goldblum a tenacious attorney, Willem Dafoe a Nazi-lite bodyguard, Harvey Keitel a prison-tattooed jailbird. The sheer pleasure and eccentricity of these cameos - alongside Anderson's instinct for a perfectly-timed comedic cut - make the film an unpredictable joy to behold. The film carries a nostalgia for the grand, eccentric lives of the super-wealthy that once peopled European hotels at the turn of the century. One cannot help but to be reminded of another story of summering cultural elite in the interwar years; Fitzgerald's Tender is the Night. Although the hotel's 'golden age' initially appears to be in the early 1930's, it is soon apparent that even M. Gustav's reign is at a period of early decline. Such hotels in the Swiss alps and the South of France had once been alive with the decadence of exiled aristocrats and corrupt civil servants, heiresses and alcoholic novelists. Thus, even the golden age depicted is not the most gilded. It is soon to be tipped into the nightmare of war and forever changed. Such a sense gives Grand Budapest Hotel its tone of wistful reverie. The ornate style that we come to expect from Anderson - his precise framing techniques, snap zooms, and mobile camera - are combined here with an emotional punch and sweet humour. These elements raise the film above mere dollhouse confectionary to to a surprisingly affecting, romantic work.